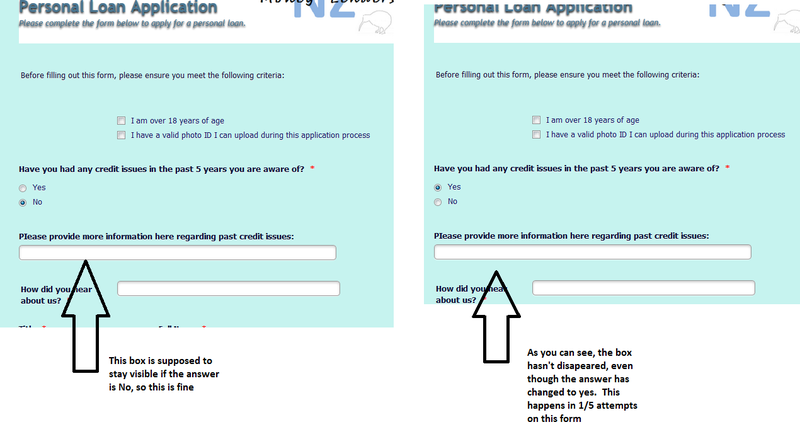 I have a few forms for a few different websites and all of them work well except one of them, the NZ Money Lenders personal application form. A couple of the conditional fields don't work properly on random occasions, usually 1 in every 5 attempts and this doesn't allow the user to complete the form or continue to the next page. Have tried on multiple computers, multiple browsers and multiple mobile devices, all have same problem. I see that you are using a JQuery library on your website, as well as embedding the form via JS embed method. This is where the conflict between JotForm's script and JQuery's script occurs. Please try using the iFrame embed method to embed the form onto your website. It should resolve all scripting conflict issues and the conditions should work as expected. Please let us know how it goes or if you need further assistance, we will be glad to help. Jacob, I am sorry, but we do not allow such promotional posts on our forum, as they are construed as spam. For this reason, your last post promoting a free giveaway on your website has been deleted. Please let us know if you need actual assistance, we will be happy to help. Thank you for your understanding. No Images? Click here http://hardwiredservicesltd.cmail2.com/t/t-e-iydkuhl-dizwktt-o/ ​ ​ Does this look familiar? Sick of annoying pop-ups and software taking over your computer that you didn't even know was there?